Im working with an freeaduino uno and a lcd + keypad shield, to make a programmable computer for the HK transmitter. But I dont know yet if it will be a full replacement of the TX electronics to generate PPM signal and send it to the 2.4G module or a kind of programmer card connected to the serial port in the back of the transmitter. Right now I have the servo reversing and dual rates routines, and all the ADC routines to read the potentiometers from the TX. If I go for the programming card, I will replace the ADC routines with a serial data decoding. The project has traveled a long way, and it become a very stable and useful platform. Im posting the latest code and schematic in this first post, and I will keep it updated. This is exactly what I am wanting to do with a spektrum radio. Any updates? Got a JR PCM 10S with trashed touch screen. Have the same idea. Hey!!! Some spare time, and some new from the code. 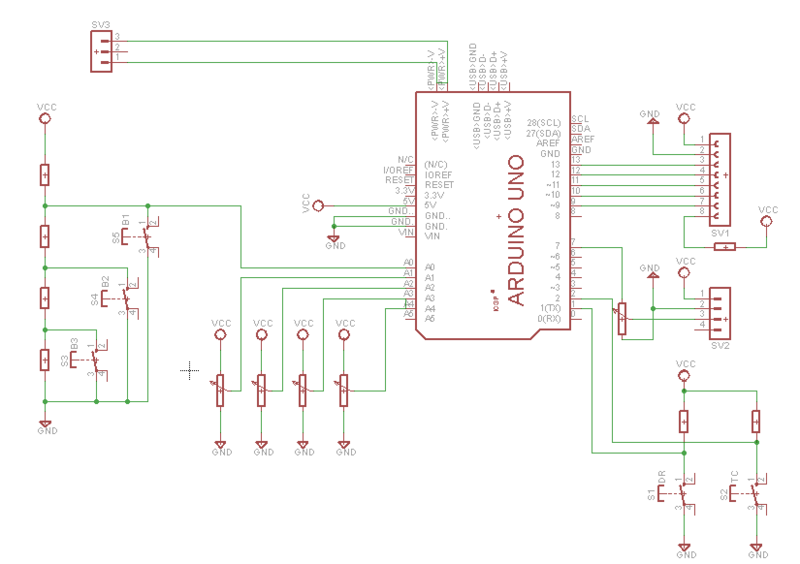 I found a RC library for arduino (a great work from Daniel van den Ouden) and got PPM output from the analog inputs, that will be connected to the gimbal potentiometers. Actually im using a couple of pots in a protoboard to make a proof of concept. Servo reversing routine is working great. Pretty simple. I think this week I will post the code (after making it human-readable) so you can try it. Can we get some expo for roll and pitch in Acro mode? I dont think that expo will be any trouble. I will finish the dual rates code and try some exponential functions to calculate the position. Hey, good luck on PPM to 2.4GHz module. You made this far, combining with module should be a walk in the park for you. I connected the arduino to the 2.4Ghz module of the Hobbyking 6ch transmitter, and it works great! The only thing that you need to take care, is that the ppm signal must be 3.3v because thats the operating voltaje of the RF module. Im using a pot to reduce the signal, but you can also use a 3.3v arduino. Here is a little video of the tests. When first time all the servos acts as TX inputs, oh man.. that's a moment goes for long. Its always good to level the signal out to in but PPM module doesn't take 5V level in? So, next should be shiny Tx case, huh? btw, what USB oscilloscope you use? I'm thinking to get one of those for field use. One I'm using on desk is TDS210, start to realize that it doesn't give enough resolution to check each step of 1024 resolution PPM. at least 300MHz bandwidth scope is able to show each single step of 1024 resolution PPM.